Most of us are aware that lower-income households in Singapore receive various government grants and subsidies. However, fewer may realise that many of these benefits extend to middle-income households, who can also receive a considerable amount of support. 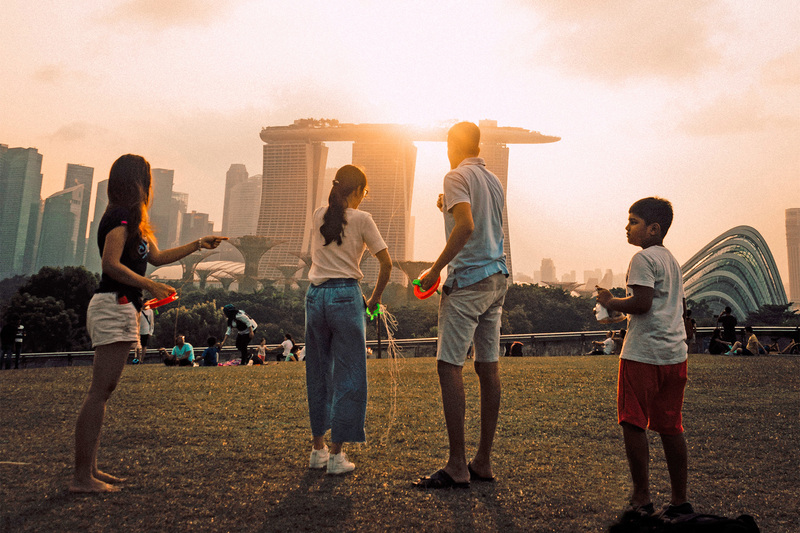 In this article, we highlight some of the most important grants and subsidies for middle-income households in Singapore. Some schemes are pegged to one’s monthly household income, with lower-income households receiving more support compared to higher-income households. The approach taken is to extend most help to those who need it more. However, others are given to all Singapore households regardless of income. Before we start, let’s first establish what constitutes a middle-income household in Singapore. According to the Department of Statistics, the median resident household income in 2017 in Singapore was $6,913 (excluding employer’s CPF contribution). This serves as a good benchmark in this discussion. You can refer to Table 18A in this link for the stats. Let’s look at some of the grants and subsidies that such a household may be eligible for. With 8 in 10 Singaporeans living in public housing, buying an HDB flat is a major financial decision for many households. To support aspirations for home ownership, the government provides significant grants for first-time applicants. CPF Housing Grant: If they opt for an HDB resale flat, Singapore households can receive a CPF Housing Grant of either $50,000 (for 4-room or smaller flats) or $40,000 (for 5-room or larger flats). If they buy an Executive Condominium, they will receive a grant of $30,000. The Proximity Housing Grant (PHG) of $30,000 is given to resale HDB homebuyers who plan to stay in the same flat as their parents, or $20,000 if their resale flat is in the same town or within 4km from their parents. Lower and middle-income Singaporean HDB households can look forward to receiving quarterly rebates to help offset their utilities bills. This is typically paid in January, April, July, and October each year. Based on 2018 figures, a household staying in a 4-room flat can look forward to $310 in U-Save rebates over the year. Baby grants in Singapore extend to all parents in Singapore, regardless of income. 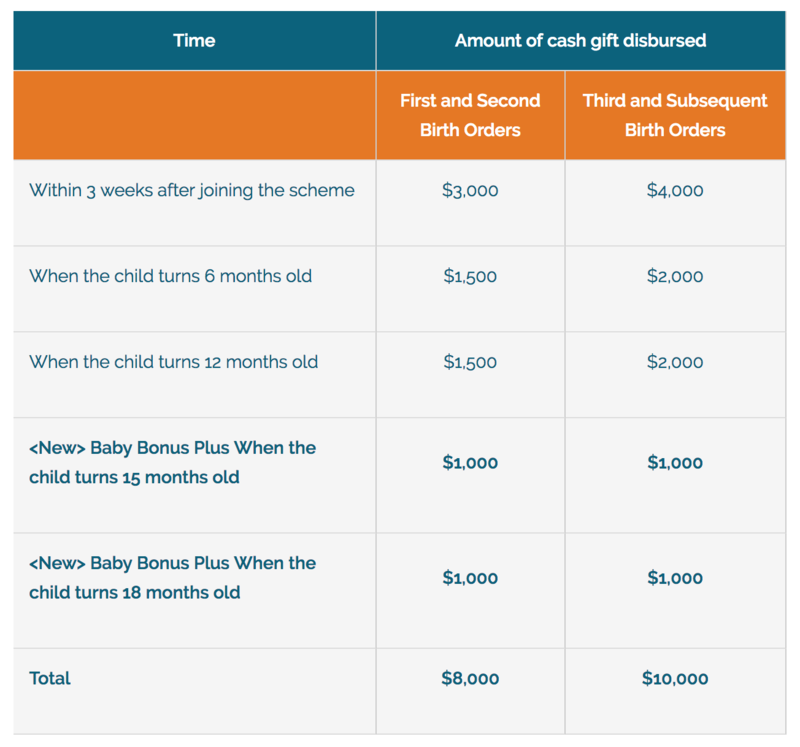 Baby Bonus Cash Gift: The first grant to expect is the Baby Bonus Cash Gift for parents of newborns. The amount parents receive depends on the child’s birth order. This ranges from $8,000 (1st and 2nd child) to $10,000 (3rd and subsequent child). The Bonus is disbursed over 18 months. Child Development Account (CDA) First-Step: Besides the Baby Bonus Cash Gift, all Singaporean children receive an initial amount of $3,000 in their CDA. The account can be used for educational and healthcare expenses at approved institutions. CDA Dollar-For-Dollar Matching: For the first and second child, the government will make a dollar-for-dollar matching when parents top up their child’s CDA, up to $3,000. This amount increases to $9,000 for the third and fourth child, and $15,000 for the fifth and subsequent child. MediSave Grant: All Singaporean babies will also receive a $4,000 grant in their MediSave Account. In total, a Singapore family having their first child can expect $18,000 in cash, top-ups, and grants. To support families with young children, the government provides significant childcare support. This helps parents, including the middle-income, address the cost of childcare. Full Day Child Care Programme: A Singaporean household with a monthly income of $6,913 can receive a basic subsidy of $300 per child for children enrolled in care centres licensed by Early Childhood Development Authority (ECDA). They can also apply for additional subsidies if the mother is working at least 56 hours or more monthly, which means an extra subsidy of $100 per month. Full Day Infant Care Programme: This household can also receive a basic subsidy of $600 for full-day infant care programme. Working mothers who work at least 56 hours per month can also receive an additional subsidy of $200. All Singaporeans aged 25 and above received an initial top up of $500 in SkillsFuture Credit. The amount is accumulative and further top-ups would be available periodically. These credits can be used to pay for approved SkillsFuture courses. Through this initiative, all Singaporeans – even retirees and homemakers – are encouraged to embrace lifelong learning. This helps ensure that our population continues to develop the necessary capabilities to remain relevant in a global economy. In 2017, close to 90% of bills for inpatient treatments required less than $500 out-of-pocket expenditure after hospitalisation subsidies, MediSave, and MediShield Life. For outpatient treatments, Singaporeans can receive up to 70% subsidy for subsidised treatments at specialist outpatient clinics. This goes up to 75% for subsidised treatments at polyclinics. Healthcare subsidies ensure that Singaporeans, regardless of income, have access to quality medical care. The highlighted subsidies and grants for middle-income families are by no means exhaustive. There are others which families can apply for, particularly if they require more customised assistance. The Ministry Of Social and Family Development (MSF)has an extensive list of these schemes. The government has introduced an array of schemes to benefit Singaporean families. These schemes are designed to help households of different income and needs. By knowing what are available, plus the qualifying criteria, middle-income households can tap on the right schemes to alleviate cost of living concerns. Are there any other useful grants and subsidies for middle-income households that we missed out? Contact us at [email protected] if you know of one and we will add it in.